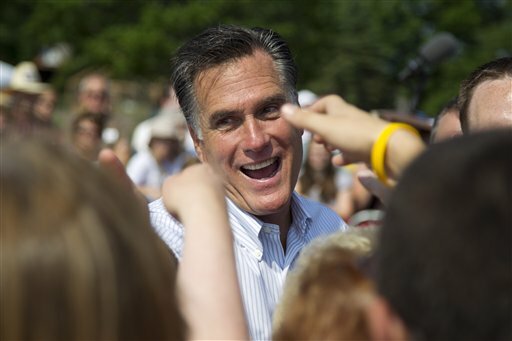 Maine Republicans say they are ramping up the Mitt Romney for President campaign in northern and western Maine in hopes of winning one of the state's four electoral votes. Maine Republicans say they are ramping up the Mitt Romney for President campaign in northern and western Maine in hopes of winning one of the state’s four electoral votes. “The Republican National Committee sees it, and we in the state see it, as very winnable for Romney,” said David Sorensen, spokesman for the Maine Republican Party. It wouldn’t be the first time a Republican presidential candidate tried to win the state’s more conservative district. John McCain tried in 2008, even sending vice presidential candidate Sarah Palin to rally voters Bangor a few weeks before the election. But picking off one of Maine’s votes would make history. Maine hasn’t split its electoral votes since 1828. The strategizing is based on an unusual quirk in Maine election law. Maine and Nebraska are the only two states that allow for a split of electoral votes by region rather than a statewide winner-take-all system. It was common for states to split up their electoral votes until 1824, when the House of Representatives had to resolve a four-way split of the electoral college and declare John Quincy Adams the winner, said Jim Melcher, associate professor of political science at the University of Maine in Farmington. After that election, every state eventually went to a simpler winner-take-all system. Maine switched back in 1972, and Nebraska followed in 1992. Here’s how it works: The winner of the statewide votes gets two electoral college votes, and the winner of each separate congressional district gets one electoral vote. Maine has two congressional districts and a total of four electoral college votes, but has not split its electoral college votes since ’72. Nebraska split its five votes once, when President Barack Obama picked off one congressional district in 2008. Maine political scientists said Thursday they have not yet seen evidence of a Republican effort to pick off one vote in Maine, but it would not be a surprise. Although it takes 270 electoral votes to become president, a single vote from Maine could put a candidate over the top in a tight race, they said. “You never know what’s going to make a difference,” Melcher said. “If you think it’s going to be a tight contest, I think it makes perfectly good sense to try to go after every possible electoral vote you can get,” said Mark Brewer, associate professor of political science at the University of Maine. The Maine Republican Party announced Thursday it has beefed up the campaign organization in northern Maine, and now has 10 “victory centers” around the state. So far, the push is limited to grassroots efforts. The party has not launched any big television campaigns in the district or announced plans for a visit by Romney or vice presidential candidate Paul Ryan. The announcement came a day after a poll by the Maine People’s Resource Center said Obama is leading Romney by 6.8 percentage points in the 2nd Congressional District. Obama has a 24.8 prcentage popint lead in the southern and coastal 1st District and a 16.2 point lead statewide, according to the poll. The Obama campaign, which has five offices statewide, has been focusing on the more rural 2nd District all along, said Toby McGrath, state director of the Obama campaign. “We’re glad they are coming to the game finally,” he said. Obama looks solid in both districts, McGrath said. Four years ago, polls said Obama was neck-and-neck with McCain in the 2nd District going into October, and he won that electoral vote by a wide margin.